In order to become a great baker, you need to have the right tools. I believe in tools that are durable, functional, and can be used for multiple purposes. 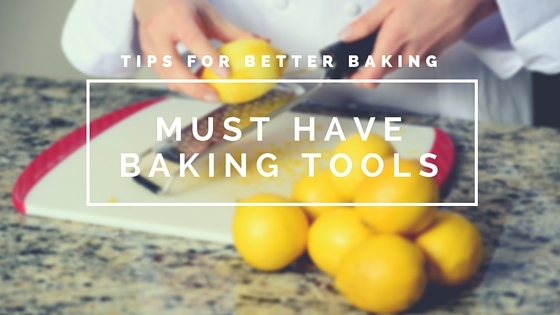 The list below includes many of my favorite and most used baking tools. I promise you, they will make your kitchen life so much easier. I much prefer weighing ingredients as opposed to measuring them by volume. It’s easier, more efficient, and reliable. A gram is always an gram, but a cup of flour can vary by up to 20%. When you are just getting comfortable working with doughs, it is helpful to know you are getting the same recipe every time. If you’re going to use a scale for your baking, chances are you will come across recipes that only give ingredients in volume measurements. 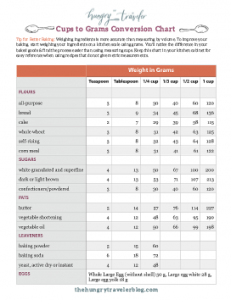 I’ve created a chart that converts teaspoons, tablespoons, and cups into grams. You can download it for free here. A bench scraper is a rectangular metal blade topped with a handle and is perhaps my most favorite kitchen tool. It’s necessary for the fraisage technique I use in the all-butter pie crust and you can use a bench scraper for portioning dough, chopping butter, cleaning down the counter tops, and about a thousand other kitchen tasks. I am lost in the kitchen without my bench scraper. An instant read thermometer is the easiest way to tell the doneness of your items. I use this when heating milk, making custards, or doing anything that requires ingredients to be a certain temperature. My favorite version is the ThermoWorks Super-Fast Thermapen which will give you a temperature reading in less than 3 seconds. Offset spatulas come on handy for smoothing batter, frosting cakes and cupcakes, and handling delicate baked goods. I have a variety of sizes and use them all the time. Parchment paper is one of my most used tools in the pastry kitchen. You can buy it at the grocery store but I find the rolls hard to manage. I prefer to buy it in pre-cut sheets from the restaurant supply store or from online retailers. A clean pastry brush is needed to brush away excess flour from dough, brush egg wash on pies, and glaze cookies and cakes. They come in different sizes but a medium size is a good place to start. I prefer a silicone brush for most uses because it is easier to clean. However, I also have a traditional bristle-style brush that I use only for brushing flour away from pie dough. Just because you set your oven to 350-degrees, does not mean it actually heats up to 350-degrees. An oven thermometer is essential for figuring out how your oven actually runs and then adjusting your baking times and temperatures accordingly. Make sure to buy one with a large dial so you can see the numbers easily. An essential tool for preparing ingredients, straining fillings, or even sprinkling powdered sugar over a finished pie to decorate it. Make sure the strainer is of a fine mesh, a sturdy construction and has a heavy gauge. It should be at least 6 inches in diameter but you may find yourself purchasing multiple sizes for different uses. The best tool for zesting citrus and grating nutmeg. They come in different sizes and varieties but I have this version that I use for things like zesting citrus and grating cheese. Microplane also makes a spice grater that I use for freshly grated nutmeg. Many of us (myself included) are guilty of using the timers on our cell phones, but it’s worthwhile to have a true kitchen time. I never find the timers built into microwaves or ovens to be worthwhile so I recommend buying one with a magnet that will stick to your refrigerator. I recommend one with a large display, easy to use buttons, and a loud buzzer. 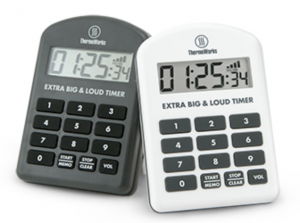 My favorite is the Big and Loud Timer from Thermoworks. Essential for cutting pie dough to an even size, opening packaging, and about a million other kitchen tasks, kitchen shears be durable and the kind that you can take apart for easy cleaning. Follow my advice and buy a commercial roll of plastic wrap from a food service supplier or a store like Costco. The larger rolls are easier to work with and the box will hold steady on the counter while you wrap items in plastic. The large size of the plastic wrap is also helpful. Trust me, you will never go back to fighting with the small rolls from the grocery store. Bowl scrapers are rectangular hard plastic scrapers that are just slightly flexible and have a round edge. They are the best possible tool for scraping the bowl completely clean and getting all of that valuable filling or batter. They are normally about 5-inches in size and can also be used as a rough measuring tool. A stainless steel ruler with inch and centimeter gradations is invaluable in the pastry kitchen. From making sure your dough is rolled out to the desired size to double checking the size of your baking pan, rulers come in handy often. Round cutters are great for shaping dough, cutting biscuits, decorations for cakes, and any other tasks where you want a perfect circular shape. Once you buy a set, you will find yourself using them all of the time. What are your must have baking tools? Comment below so we can discuss! Subscribe to my mailing list to receive the latest edition of Tips for Better Baking in your inbox weekly.